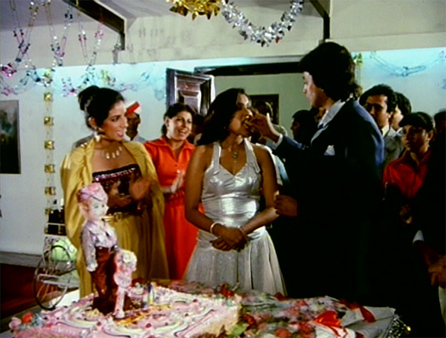 MemsaabStory turns one today, pretty boring for all except me I know; but perhaps made a little more fun by cake and hand-feeding à la “the greatest Disco movie ever made in India” (according to the back of the DVD cover). How I love the Indian penchant for qualifying grandiose statements! Thanks to all of you who keep coming back to read, comment, make me laugh, and educate me! You have greatly enriched my movie-watching, and my life. Posted on June 22, 2008 at 8:33 am in Everything else, Hindi movies	| RSS feed You can skip to the end and leave a reply. It’s comforting to know that I’m not alone in my Bollywood obsession…. Carla, I am honored to share a mind such as yours my dear, and janamdin ki badhai to you too! The only way it could be better is if Mithun went on a world tour of all your readers and fed us cake. Congrats! Happy Anniversary, Memsaab! I hope we will see many more years of wonderful blogging from you. The feeling is absolutely mutual. As Filmi Girl said, thank *you* for blogging! Whee! Mubarak ho! Thanks for writing incredibly fun and informative reviews – and being a great watchalong partner, too! I love Indian filmi birthday parties beyond words. I love the uncoordinated clapping, the pronunciation of “birtDay”, the enthusiasm and warmth with which everyone greets the birthday boy/girl, and the inevitable plot complications which unfold. I chose DD for this post b/c I think it may be my favorite one, what with all the angst and hand-feeding and all. Plus Dolly freaks out on evil Mr. Oberoi and throws a drink in his face. And Mithun gets to give his revenge speech! And the cake is pretty special too. Now I will need to take another look at the Rani K3G one :-) Any other favorites out there??? A Very Happy burtday to you memsaab. Keep up the good work and keep us (all your readers) supplied with more of your super Bolly- reviews and trivia! HAPPPY Birthday memsaab! your knowledge is far greater than i can be as a 17 year old trivia buff! You rock! 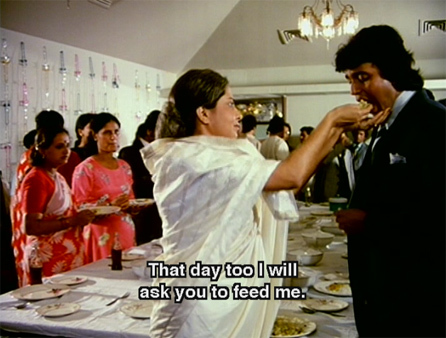 I love Baby Farida’s filmi birthday in “Ram aur Shyam” where Pran tries to get them to cut the noise and then Dilip Kumar shoves cake (that had fallen on the floor) into Pran’s mouth! Dilip takes birthdays very seriously…. Memsaab, I discovered your site just a couple of weeks ago, and it’s really the only blog I’ve ever found myself returning to, again and again. So here’s a heartfelt (or, as Sanjeev Kumar would say in Manchali, may be even felt from the lungs!) thank you. Congratulations, and jeete raho! Oh, a very very happy birthday. And like we say in India, and specially in Indian films, “Tum jeeo hazaaron saal, saal ke din ho pachaas hazaar” – May you live a thousand years, and may each year have five thousand days. Awww, you are all so nice. What a great way to begin the day, reading all these comments. Bollyviewer and Rum: thanks from the bottom of my heart! Banno: thank you for the sentiment and for teaching me a great phrase in Hindi :-) I don’t know that I WANT to live that long but that’s another story! I’m late, but Happy Birthday Memsaab – your blog is such a great pleasure to read, thanks so much for sharing it with us. … much more on “Hindi movies and other stuff you love about India (plus occasional random nonsense)”. Oooh good filmi birthdays, DG! and thank you :-) May we have many more happy Dharmendra moments too! Ranya, thanks for teaching me a new way to say HB! and thank you too Shweta :-) It wouldn’t be the same if you guy didn’t read it. Ha ha! It doesn’t really have any style either! but thank you, and thanks Sitaji!